Sometimes I think I'm not actually the worst forum poster. SirCallen wrote: Sometimes I think I'm not actually the worst forum poster. is there a contest of who is the worst forum poster??? It's been confirmed for a while that I am. It's simply unreal how you constantly think you are in the right about everything. What is it that makes you think you, and you alone knows the truth? What is really odd, is that you made 1400 posts, not having any message or meaning about anything, exept your very odd take on woman, your cryptoes that are crumbeling in to oblivion soon, and a lot of "lols", and non sense posts. If you have any comments to what this thread is all about, please post them. If not, go somewhere else with your emphty talk. Yeah that is a perfect example of the kind of posts you make. I forgot to mention that category. Thanks for reminding me mr @Snuden. iwillspankyou wrote: Yeah that is a perfect example of the kind of posts you make. I forgot to mention that category. Thanks for reminding me mr @Snuden. I would like to think I can be much worse, but my creativity is restrained on ESOC! You have the idea to write a piece because you finally found the passion for it after a long stroll? Now we are getting close to the mid term election, and the question now is how big the blue wave will be, come november. Even Ted Cruz in Texas, of all plases) could lose his seat. I think the inequality in vages and property are really bad, and need to change. I think that it will have a deep impact on the global economy if it continues like it have been for the last 40 years. We will all suffer, not only the ppl of USA. For your sake, I really hope that you will get a healtcare system, that prevent ppl from actually dying, cos they do not have insurance, OR they risk being put on the street when they have healthinsurance, but have to pay high deductables. I hope a new shift in political climate, will support switching to more green energy, and that the USA can be a spearhead, instead of a nation that give full speed to more carbon being burned. I hope that you will get an education system that give every student, whatever their parents earn, the possibility for a higher education. I hope that the politician you elect, actually work for you, instead of their doners, meaning that money should be banned in politics. That was some of my hopes. I know that it will prolly not all happen very soon, but the fire has been lid, and I think more and more ppl are being aware that they are getting screwd over by the ppl they elect. If you take a look at the issues that Bernie Sanders ran on in 2016, most of my answers will be resonating with that. @iwillspankyou Which party would you prefer control the House and Senate? fightinfrenchman wrote: @iwillspankyou Which party would you prefer control the House and Senate? Right now there is little correlation with the voters wishes and what the politicians deliver. There are some hope though, cos the so-called "progressives" are pushing the Democrats further to the left, and more democrats now say they want a medicare for all plan. There are also made progress in the Democratic party; for instance are the "superdelegates" not allowed to vote with their 10.000 to one vote, in first run. I do think that the Democrats are more in line with the voters, but they have a long way to go imo. You managed to write 9 lines, without actually answering a very simple question. Let this be a hint to your question about where all good discussins went. @Snuden sorry if you did not understand it, but I guess it should be clear to anybody else. I would want politicians who are in line with their voters! I do not like voting for the less of two evils, like the last election was about. 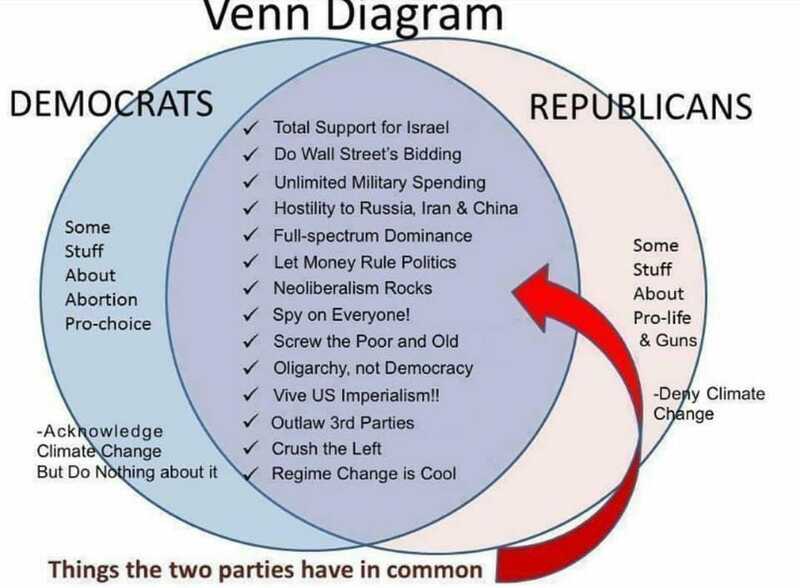 There are two major political parties in the US - Democrats and Republicunts. You are asked, which you would prefer controLOLed the House and the Senate. In your first reply you just wrote your own political observations and your second reply also failed to answer the very simple question. I don't see what there is to misunderstand. There's no answer to that question though. Compared to European politics, republicans are far-right whereas democrats are slightly right. Spanky doesn't have a party that would suit her. Either way, I don't see why spanky even cares. American elections are irrelevant for the developed parts of the world. cmon, why is that not clear? If you twist my arm, I prolly would say that Democrats are more in line with the ppl of USA. And they have improved, unwillingly I might add. The US election is (unfortunately) not irrelevant for the rest of the world, it is after all still the biggest economy in the world. Their strong military presence around the world is also something their allies benefit from. i think the 2 party system of the usa is just huge crap.